One of the most spectacular viewpoint in Kerala is the Pothamedu view point. It is not every day that one gets the opportunity to visit such a breathtaking view. Located at a distance of 4 kilometers from Munnar, the Pothamedu view point is situated on the National Highway and offers a thrilling view of the valley below. The Pothamedu view point is a popular tourist attraction and is known for its spectacular beauty. This view point also offers trekking and hiking too and is a photographer’s haven. There are also a few resorts that offer stay amongst the lush greenery of the surrounding hills and valleys. Because of the height it is located, Pothamedu view point offers a spectacular view of the Munnar hills which can be viewed in a 360 degree angle from the viewpoint. Attukal waterfalls, tea gardens, Kundana Dam lake and Blossom Hydel park. The best time is during August to May when the view is clear offering perfect shots from the camers. By air : The nearest airport is the Cochin airport which is 110 kilometers. By train : The nearest railway station is Aluva railway station which is about 100 kilometers away. 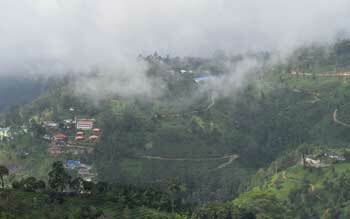 By road : A bus depot is located at Munnar at a distance of 60 kilometers. Hiring a taxi is also another option which can be done at Munnar.